Your first means of defence against buying a lemon should become your matnra 'buy with your head, not your heart'. The heart can be blind and the bling can be loud but the brain knows better. Here are some questions you ask over the phone. When was the last service done? Most bike owners will know this and some will share it openly to build your confidence but others may not want to talk about it, perhaps they did it themselves? Perhaps it hasn't been done, perhaps its had the same oil in it for ten years! It's great if they say it was regularly serviced. Great. Now prove it. I want to see a receipt with a matching rego number with a date and if you're buying from your own State (we have 6 States and a Territory in Australia spanning thousands of kilometres, it's not unusual to buy from interstate) make sure its a reputable dealer, if you don't know the dealer, take note and look them up later. Touch the engine first. Cold engine - not started. Warm engine = started recently. First and foremost when you first see it touch the engine, even if you just rub your thumb on the crank case cover do it to confirm the bike is cold. To properly assess the health of an engine you must see it cold start. A warmed up bike could be sign of trying to hide something. Take a torch Use your torch. Always take a torch, look into the really hard to clean places but also look at sealing points on the engine case, do they appear to have sealant visible (ie the engine has been apart) if so this can be a dodgy flag. Look for signs of wear, leaks, brand new parts, anything unusual. Listen from the front. All you can hear from the back is that gnarly exhaust note. Rember, head, not heart." 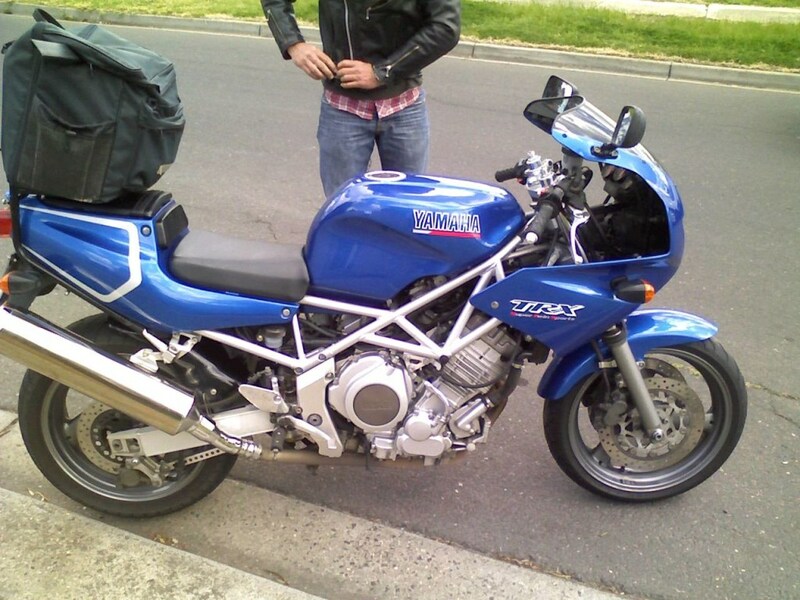 Start it up and listen from the front of the bike, there you will hear any rattles or suspect noises. You won't hear anything from the back. Don't worry about what people think of your technique, be confident and do your own assessment. Check the oil. Brown = good. Black = BAD. Check the oil, open the dip stick and check it as you normally wood. You don't want a bike that has a belly full of filthy oil and this should back up whatever they answered to first question above. Really dark brown or worse yet really black oil is a sure sign of neglect. How old is the current rubber? Old rubber is a killer. Trust me, I've made the mistake before and bought a bike that had been sitting on tyres for 5 years. The tread indicator was still good so I took off on a 2 hour ride home. The bike had speed wobbles bad. This is from hard tyres and there ain't nothing you can do but change your hoops. Simple as that. Old rubber may look good but it is almost surely passed its used by date. New hoops can transform a secondhand purchase and you wont know the difference until you rubber up. 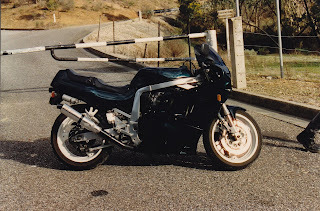 My old Yamaha TRX 850 had rock hard 5 year old tyres on it at the time of purchase. How many km on the brake pads? An easy thing to overlook and not THAT expensive to replace, but if you are buying seconhand in Victoria, you are going to need a RWC (Road Worthy Certificate) and the first thing most shops go for is the breaks. They are after all, the one thing that are going to stop you in an emergency. How are the chain and sprockets? Chain I recently learnt a great tip for checking your chain. Squat down at the back wheel and pinch the chain exactly half way down the back sprocket. Pinch it from both sides and try to pull it outwards. You should find that it's really quite tight and doesn't pull out much at all. If you can pull it out a couple of mms (millimetres) then you need a new chain. It's that simple. While you're there take a look at the links and if they're shiny and bright silver then your chain is pretty dry and maybe that is a sign of poor maintenance. Ask them. How did they answer? If they have just been slack, maybe now's a good time to back away from this one? Most of the time you won't see the front sprocket, it's tucked away beneath you sprocket cover, but the rear should be easily visible on most bikes. Take a look at the teeth. Are they nice and sharp and come to a good point? Or are they square, worn and flat? You want the former, and not the latter here. No matter what a chain and sprocket are going to be oily. But big build ups around chain guards and heaps of brake dust or really oily coated sprockets are just a sign of more poor maintenance. No chain? You've found a shaft drive, buy it. Haha, seriously if there isn't a chain and sprocket you most likely looking at something like a Yamaha Diversion, a BMW or a Harley Davidson. It may or may not make a difference but something to think about from experience is whether the bike was living by the sea. Especially in the case of exotique bikes that don't seem to handle seaside living too well, or a bike that was born on the farm is always going to be a farm bike no matter how many times you wash it. Does it have any encumbrance? This just means do they owe any money on it. If so, that money has to be cleared before ownership can be transferred to you. As a rule, if you can avoid buying a bike with encumberance, then do, but sometimes people get in financial trouble and you might have a bargain on your hands (desperate measures require desperate times). If this is the case you can protect yourself by requesting to pay out the incumbent directly with any left over balance going to the buyer. 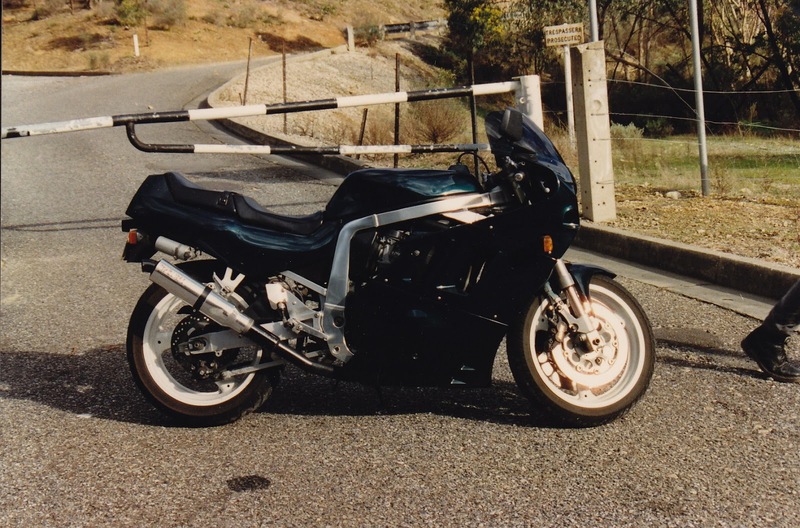 My beloved Suzuki GSXR 750 circa '96? Remember what I said about buying with your head and not your heart? Try. Try really hard. We all get star struck by the elusive shiny new motorcycle but if it blows your budget, or something doesn't sound right to all of the above questions, maybe you should just wait for the next one. Above all else, do your research. Ring your insurance company and get a quote for full comp, and third party fire & theft. Ring your local bike shop and ask about a major service for that model, how much is it? Research forums for the make and model you are looking at, there is a forum for everything. How much is the RWC and transfer fees going to be, it all adds up and it's best to be prepared. Hope that some of our tips help you make the right decision for your next machine.